According to the Centers for Disease Control, over 4.7 million dog bites occur in the United States every year. Of those, nearly 800,000 require medical care for injuries. And 50% of the victims are children. The insurance industry pays out nearly 1 billion dollars every year for dog bite claims. The majority rule in most of the states is that of strict liability which forces owners to pay the victims of any dog bites excluding trespassers and/or provocation of the dog. Strict liability states typically require the owner to make full compensation to the dog bite victim upon proving a dog bite and damage from the dog bite to the victim. Unfortunately, Georgia is not a strict liability state when it comes to dog bite law. In fact, Georgia currently favors dog bite owners versus the victims. To successfully make a claim for dog bite injury in Georgia, the victim must prove more than one ground of liability. A person who owns or keeps a vicious or dangerous animal of any kind and who, by careless management or by allowing the animal to go at liberty, causes injury to another person who does not provoke the injury by his own act may be liable in damages to the person so injured. In proving vicious propensity, it shall be sufficient to show that the animal was required to be at heel or on a leash by an ordinance of a city, county, or consolidated government, and the said animal was at the time of the occurrence not at heel or on a leash. The foregoing sentence shall not apply to domesticated fowl including roosters with spurs. The foregoing sentence shall not apply to domesticated livestock. Under the Georgia code, the victim must prove that (1) the animal was dangerous or vicious; (2) that the owner knew that animal was dangerous or vicious; and (3) that the owner carelessly managed the animal or let it run free. The ordinance ground in the statute requires that the victim prove that the animal was not on heel or unleashed under city, county or government ordinance. Excluding local violation of leash law, the Georgia statute is a generally a one free bite law. Georgia has traditionally adhered to the "first bite" rule, which holds dog owners liable for their animal's behavior only if an owner knows that a dog has the 'propensity to do the particular act [biting] which caused injury to the complaining party.'" Clark v. Joiner, 242 Ga. App. 421. 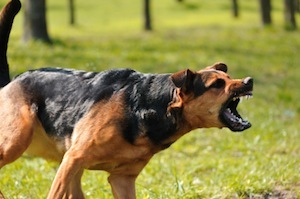 Therefore, to establish liability under this section of the Georgia statute, the dog bite victim must prove that the dog owner knew or should have known of his dog's propensity to do the particular act which caused the complained of injury. Hamilton v. Walker, 235 Ga. App. 635 (510 S.E.2d 120) (1998); Durham v. Mooney, 234 Ga. App. 772, 773 (507 S.E.2d 877) (1998). Victims must prove that the owner reasonably should have known that his/her animal had the tendency to bite based on a previous incident of viciousness that does not have to be a prior bite. Under the statute, one could show careless management by showing that the animal was tied to a chain that was able to reach the sidewalk, playground or area of the victim, Similarly, one could show that the dog was left entrusted to a minor or incompetent caretaker. Proof of allowing the dog to go at liberty would include letting the animal outside without a leash or leaving a door open so that the animal escapes. The factual scenarios of careless management or allowing the dog liberty could go on and on. Code of Ordinances, City of Atlanta, Georgia, Sec. 18-61. Applicability to portion of city within DeKalb County. (a) Generally. The following shall apply to that portion of the city within DeKalb County:(1) Duty of owner to keep dog under control. It shall be unlawful for the owner of any dog or for any person having a dog in such person's possession and control to permit the dog to be out of control and unattended off the premises of the owner in that part of the city within DeKalb County or upon the property of another person without permission of the owner or person in possession thereof. (2) Definition of dog under control. A dog is under control if the dog is controlled by a leash, is at heal or is beside a competent person and obedient to that person's commands or is within a vehicle being driven or parked on the streets or is within the property limits of the dog's owner. The Law Offices of Kevin C. Ford is currently accepting dog bite cases throughout Georgia. Please contact us today for a free evaluation and consultation.